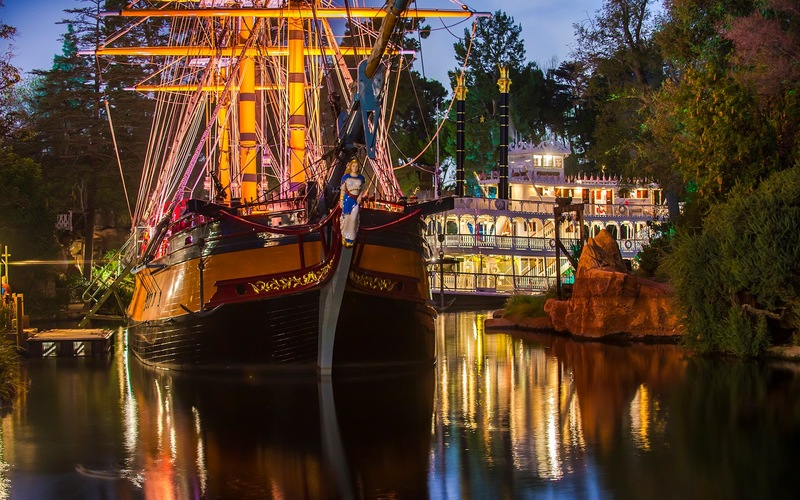 Seeing the Sailing Ship Columbia and the Mark Twain together in the same scene is not common--except during evenings when FANTASMIC! is scheduled to be performed. Then, it's quite common, because the two ships are lined up just at the riverbend to await their places in this nighttime spectacular! On the same night when I watched FANTASMIC! from a different and unique view, I also snapped some photos of these two vessels waiting in the peaceful waters before the show. It's such a lovely and serene scene, and despite the darkness of the actual setting, with the help of a trust railing, I was able to stabilize and hone in on the right spot to focus. This picture definitely owes itself to the advances in DSLR technology! Without the full frame and modern sensor, I doubt I could have achieved a shot as nice as this one! The S.S. Columbia and the Mark Twain wait in their places before their roles in FANTASMIC! arise.